Sometimes it’s sleeping through the night, usually it’s not sleeping at all, and as of late it’s ‘borrowing’ things from the grocery store. Nothing stands a chance. All kinds of random things get stuffed into my bag, forcing me to keep a watchful eye on my little clepto’s. Yesterday, we made it home with an orange bell pepper (what? no fair trade dark chocolate bar with almonds + sea salt?!) and as you can see, it ended up in our dinner. Hey, at least it wasn’t green. Keeping things neat and organized is definitely not my forte when making stir-fry’s. Ingredients are splayed out all over the place, and every Asian-stlye condiment known to man wants to join the party. It’s like a scene from Fruit Ninja. 3 ingredient minimum, usually 1 protein + 1-2 veggies. Everything is prepped and ready to go before I start cooking. Stir-fry sauce is made in advance and kept it in the fridge. A ‘garbage’ bowl is kept nearby to collect the scraps. Stir-fry in small batches to prevent the dish from becoming soggy. Oh, and it is absolutely delicious over quinoa instead of rice. 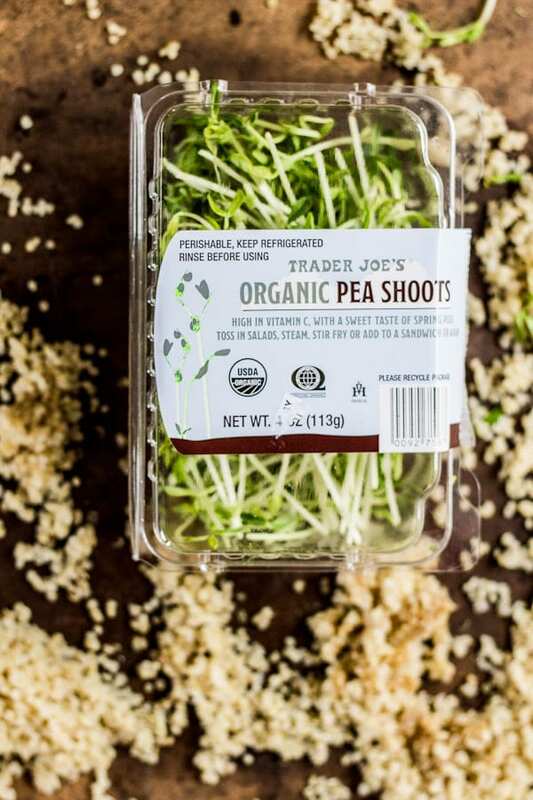 I’ve been re-kindling my love for pea shoots lately, and I have to say that they make an excellent addition. So light and fresh. Also, the mighty cast iron pan is used in lieu of a wok (don’t have one, or the space for it) with great results. The intense heat chars the the ingredients adding a nice smoky flavor. If you have one, I highly recommend giving it a try. And now my friends, dinner is served. For this recipe, I like to use top sirloin (not regular sirloin). You could also substitute with flank steak, however I find that it’s not quite as tender. 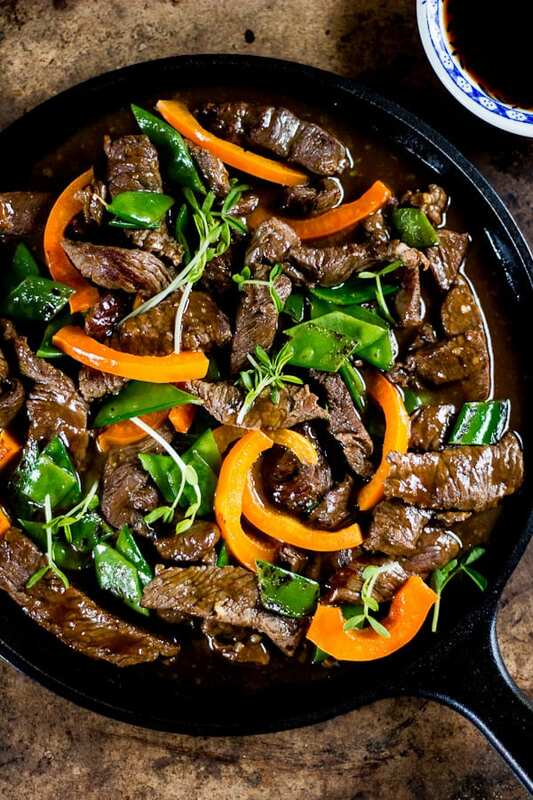 For best results, thinly slice the flank steak against the grain and marinate the meat in half of the stir-fry sauce, about 10-15 minutes. You will need to double the sauce (recipe below). To thinly slice the meat, a great trick is to pop it in the freezer for about 10-15 minutes, and then slice it with a sharp knife. You will have more control over your portion sizes this way. Let the meat rest before cooking to take the chill off. * I like to use top sirloin (not regular sirloin). You could also substitute with flank steak, however I find that it's not quite as tender. 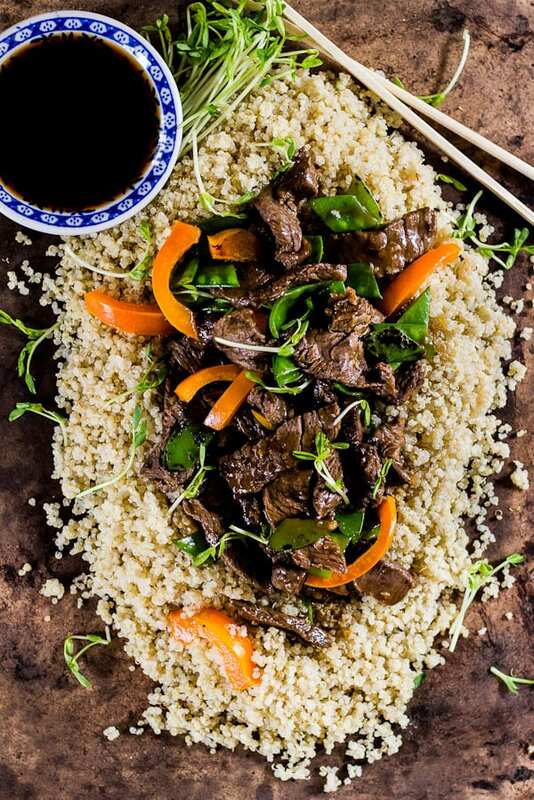 For best results, thinly slice the flank steak against the grain and marinate the meat in half of the stir-fry sauce, about 10-15 minutes. You will need to double the sauce (recipe below). ** Grate the garlic + ginger using a microplane. In an empty jam jar, add all of the stir-fry sauce ingredients and shake well until the honey is dissolved. You can also whisk everything together in a small bowl. Warm the olive oil over medium-high heat in a large cast iron skillet (or saute pan). Using tongs, add a portion of the meat to the pan and give it a quick sear, about 1-2 minutes. Do not over crowd the skillet. Remove the meat and transfer to a plate. Continue to cook in small batches to prevent the dish from becoming soggy. To the pan, add a little bit more olive oil and the grated garlic and ginger. Stir until fragrant, about 30 seconds. Add the snow peas and saute until crisp tender. Remove from the pan. Add the bell pepper and saute until soft. Remove from the pan. Add the stir-fry sauce and bring to a quick boil to thicken. Add the meat + veggies back to the pan and stir to warm through. Garnish with pea shoots right before serving. Serve over quinoa or rice. This looks INCREDIBLE, and I love your idea of streamlining the ingredients, it makes the prospect of a stir fry much more manageable. Pinned! 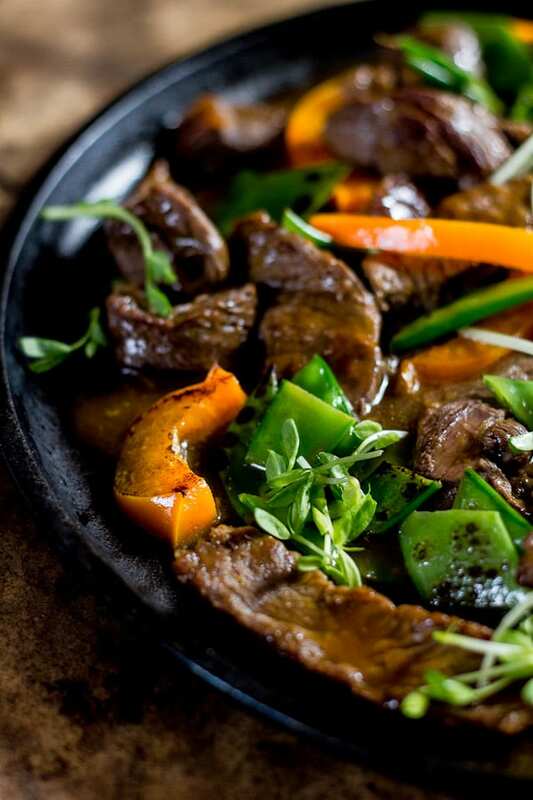 I love stir-fry, what a mouth watering dish! Hey, at least you have healthy little cleptos ;) Stir-fries are fun and this one is beautiful. Also love that cast iron pan! What and bright and vibrant dish! My friend recently told me she grows her own pea shoots in a mason jar in her kitchen! 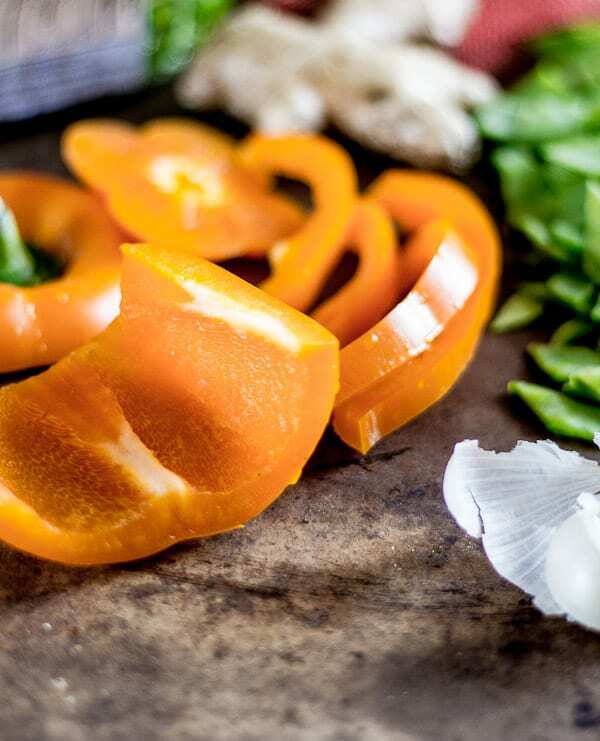 What a tasty looking little dish, and I’d say your secret shoppers made a pretty good choice with the orange bell pepper. Nice accent color, kids! I usually use flank steak in dishes like this, but I’ll have to give your top sirloin a try. Thanks for the tip.